In the year Y2K, I became an early adopter and spent several hundred quid on my first proper digital camera, a snazzy 1.3 megapixels (!) Kodak DC240i in a fetching iMac translucent blue. I loved it. A year or so later, out with Eldest, we contrived to drop it onto the pavement. Repairs at Jessops cost me £120 -- ouch -- and I had a consolation cappuccino at the nearly next door cafe, a place called Blends on the Buttermarket. 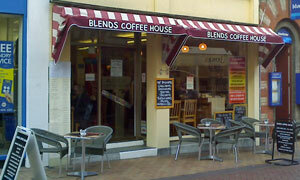 Opposite BHS is Blends, normally with a couple of tables outside... Can get busy. One of the few places to offer a pot of leaf-tea, and with one of those removal filters to prevent stewing. Try the sizeable Bakewell tart. Glad that Grenvyle got here first to secure a sit-down place, 'cos it's heaving (pinned to the counter is a sign describing their next-in-line seating policy). Although he's been here for all of five minutes, he's already pouring his tea and nibbling his sarnie. There's pages of sandwiches, jackets and hot/cold wraps from which to choose, and it's a tough call when the waitress appears. Before you know it, my drink (bitter Fentiman's lemonade) and food (sweet chilli and chicken baguette with unadorned salad) appear. My, they're efficient here, ideal if you're pushed for time. Plates are cleared away -- people are waiting -- and dessert orders are made. Breakfast menu also looks good, and includes Staffordshire oatcakes. Couldn't resist the fatboy option of the Belgian waffle with warm maple syrup & dollop of Movenpick ice cream: yum. Hey, I'll bike this off on the way home. Wide ranging coffee selection too, and my double shot Americano should gain me automatic admission to Timmy Mallett's Wacaday. Still going strong: nice one, Blends. If it was a car -- VW Jetta. If they were passing by -- Anne Charleston.